The dark shading and staining of roofs, walls and exterior surfaces in central California is generally due to the cyanobacteria gloeocapsa magma. Many times, exterior building surfaces are virtually free of all dirt and grime, but the presence of the dark bacteria is clearly evident. Typical cleaning procedures use power washers to remove the visible stains and dirt. While valuable for some applications, pressure washing itself does not kill the spores and can be very destructive to many of the most common exterior coatings in use today, including stucco and synthetic stucco such as EIFS and Dryvit. Pacific Roof Cleaning provides an alternative to using high pressure on delicate exterior surfaces. Our ‘Soft Wash’ process quickly and effectively removes bacteria, algae, dirt, even insects and spider webs. It not only cleans but disinfects and sanitizes as well. Our proprietary blend of cleaning agents are custom blended for each application to provide the safest and most effective results. It is applied at low pressure and then gently rinsed away. Our cleaning process is less invasive to business and commercial properties. Beautiful results are achieved much quicker than using high pressure methods. The results last far longer as we eradicate the source of the problem with a 100% kill ratio on mold, mildew & bacteria. As far as the final product, our customers are generally unanimous in saying: “Amazing, it looks just like new." Wondering if we can help you? Contact us now and let us provide a free demonstration of the results you can expect on your project. Pacific Roof Cleaning specializes in non-pressure, manufacturer approved roof cleaning. Many cleaning contractors like to use the term “Soft Wash” but their process includes using a pressure washer. We never use pressure. As an experienced building contractor and certified roof inspector, we have seen the consistent damage this causes, even by highly experienced professionals. Our “Soft Wash” process produces immediate results that last four to six times longer than pressure washing. As far as the results, we let our real customer testimonials, non-manipulated before and after photos and years of proven success speak for themselves. We enjoy providing a knowledgeable solution to the problem of dirty roofs in Santa Cruz, Monterey and the Silicon Valley. If you are interested in our services or have any questions regarding the causes of roof algae or the proper method of removing it, feel free to contact us. RME’s, facilities managers and building owners that perform timely and preventative maintenance are making a wise investment. Studies show that commercial roofs are consistently replaced years before the expected service life of the roof. Experience shows this is almost always due to neglect or improper maintenance and repairs. Pacific Roof Cleaning provides cost effective scheduled roof maintenance, gutter and drain clearing along with professional inspections for millions of square feet annually. We also provide commercial skylight and solar panel cleaning. 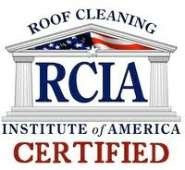 We are an experienced building contractor and NRCIA certified roof inspector. While providing our service, we identify issues that require attention and provide this information along with photo documentation to your trusted service provider. Alternatively, we are prepared for any facet or scale of repairs or improvements on all types of commercial roof systems. Many of the most successful and respected organizations have depended on us for years. Ask for our commercial references to find out why. We provide service from Carmel to the entire Bay area from our centrally located base in Santa Cruz. Many times we are able to give accurate estimates within hours through satellite imagery. If you would like us to provide you with an estimate please include your address.